Keywords Aur Queries Me Kya difference Hota Hai ? Kya Post me Keywords Aur Queries dono use karna chahiye ? 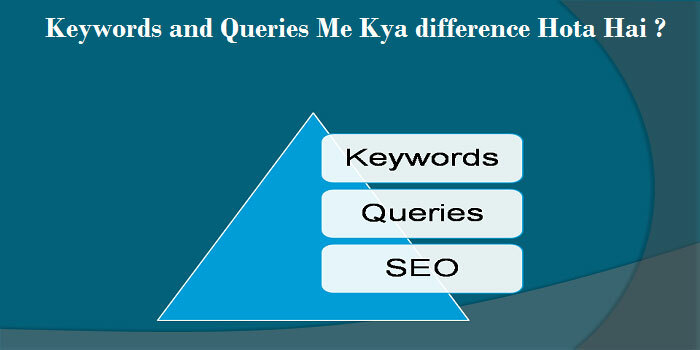 अब आप जान गए होंगे कि Queries और Keywords के बीच क्या Difference होता है. यदि फिर भी आपको Keywords and Queries से related कोई confusion है तो आप comment के माध्यम से हमसे पूछ सकते हैं। यदि ये article आपको पसंद आये तो इसे social media पर अपने friends के साथ share करना ना भूलें। Best of Luck ! धन्यवाद सर आप इतने अच्छे पोस्ट के लिए. Dear Kamlesh ji, aap read more par right click karke inspect elements par click kro fir dekho konsa tag use huya hai fir use code me search karke edit Kar do. Keep visiting on BlogLon. Congratulation kamlesh bhai, keep visiting. dear surendra sir, keywords se related bahut sara confusion is post me clear ho gaya. ab mai confidance ke sath apne post ko seo optimized kae sakta hun. thanks A lot. sir ham seo yoast ki setting me tags ko noindex karte hai. to kya post create karte samay tags use karne se seo related koi profit hai? kyonki hamne to ise noindex kiya hua hai. Ashish ji, thanks for your comment and tag links noindex hoti hai lekin iska profit ham keyword aur queries ke insertion ke liye use Kar sakte hai jisse text read ho lekin uski link nhi. Aur ise noindex Kiya jata hai jisse duplicate content ki problem na ho. I hope aap samajh Gaye honge, so keep visiting. thanks surendra sir, but i am new in seo field to mujhe to 80% chije clr nhi ho pa rahi hai ki kaha se aati hai and kya hoti hai plz help me ki main kaha har ek chij clear karu aapne boht achhe se sab kch samjhaya hai esliye socha aapse he help lun. Apko jyada se jyada SEO ki post padhni chahiye, aur ise sikhne me thoda time lagta hai isliye aap every post ko seriously padhkar samjha kare aur apne blog par apply Kiya kare aur jo cheej samajh me nahi aati use comments karke puchh Liya kijiye.